An often misunderstood but potentially deadly weapon, the cane is one of the few self-defense tools you can take virtually anywhere no matter what level of security you're facing. 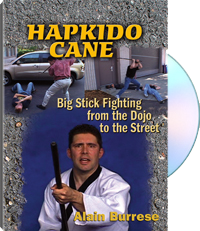 In this hard-hitting video production from Paladin Press, veteran fighter Alain Burrese shows you how to maximize the combative use of the cane, turning it from just a leg support to an invaluable part of your arsenal. Stripping away the flashy martial arts moves to leave behind the bare essentials of big stick fighting, Burrese teaches you the rapid, vicious strikes that take advantage of the cane's size and heft, and then transitions seamlessly into brutal combinations of striking and blocking that will have your opponent wishing he'd never mistaken you for an easy mark. From there, he shows hooking and grabbing techniques that enable you to move into joint locks, chokes and stick submissions relying on street-proven principles of movement, not fancy dojo dancing. Whether you carry a cane out of necessity or choice, this video will give you information on big stick fighting you can use to keep yourself safe on the street. For information purposes only.